Trinity - a necessary cognitive barrier? From the readings this morning: If anyone is in Christ, there is a new creation… If you keep my commandments, you will abide in my love. I want to hold those words from our readings today in our thoughts as a firm centre to which we keep returning. I promised that I would preach on Stewardship – but I find it hard so to preach. Why? It embarrasses me. I don’t like asking for money. But why should I be embarrassed? (After all I am not seeking something for myself but for the Cathedral.) Just asking this question has nudged me in to reflection and maybe discovering something about myself; maybe something I’d rather not find. I think we avoid frank talk about money because it has something to do with that intimate place in our heart where we need security, and we do not want to reveal our need or give away our security to someone. And that we fear being dependent on others because the idea of dependence is a threat to our security. Think of those advertisements for KiwiSaver; or the shining ads for upmarket retirement homes. And there is all this pressure on us to secure our future and have control of our lives as much as possible. (Very unbiblical; - cf Matthew 6.19-21). If anyone is in Christ, there is a new creation… If you keep my commandments, you will abide in my love. I keep returning to these verses and pondering the phrases – ‘a new creation’, ‘abide in my love’ – at their heart is the experience of a daily conversion, and of a closeness to God that puts all fears, all self-consciousness and pride in their proper place. That is the mystery of faith and the freedom and the wholeness God calls us into. It is that same mystery upon which this Cathedral is founded and to which it daily gives witness. Our pioneers in the faith built this Cathedral to do exactly that: in the midst of the city it is to give witness to God. The imposing architecture, the many steps, the great doors, and the Bishop’s Walk with Bishop Nevill holding the miniature of the Cathedral in his hands, are all expressions of the vision of this place – it witnesses to the glory of God; it calls us all to wonder; it summons our city to faith. Of course times have changed since those early days: our society; and how we speak of faith and share the gospel – these have changed also; yet the vision endures and we continue to serve all in this city; we are inclusive and we endure. 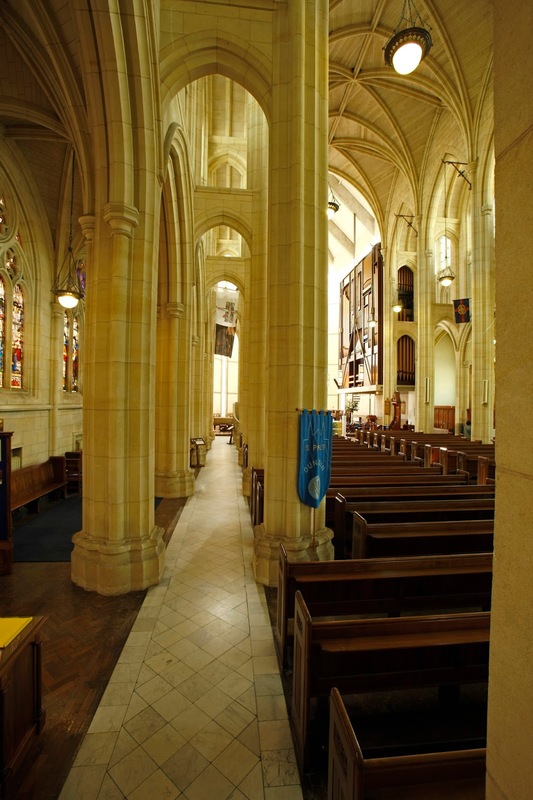 In the Cathedral archives are the lists of endowments and diverse bequests and to scan these lists is to read a living testament and a continuing story of faith and vision. 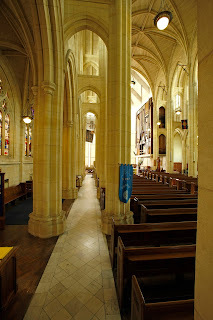 The interest earned by those endowments keep the Cathedral going; our forebears in the faith are working still with us in the present – even now with each quarterly run of interest payments across the years - they still help to sustain the shared vision of the Cathedral as the place in the midst of the city where we bear witness to God. As we grasp the truth of being that new creation we discover a new freedom and that includes our attitude to money. The fact is that once our giving reflects our hope and our faith, we are changed. Our hearts are re-engaged by the act of giving; our faith grows as giving expresses our commitment. As we give we become a new creation. Only in this way can we secure the future of this Cathedral and its mission in this city. We are all in this together, contributing across time and space, to bring into being something of the kingdom of God; we are all co-workers , looking toward a new creation; we are working together to sustain, re-create, reform and renew this cathedral. We all have a part to play. In that private space where we make such choices, the opportunity is ours.